Today, February 20 marks the fifth anniversary since the Grassroot Tennis Club was officially launched. 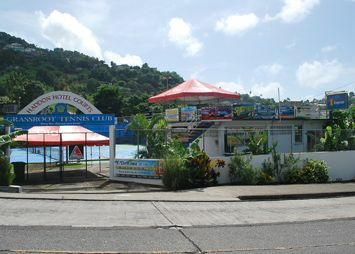 Embracing the âBring your racket and comeâ theme, the club has grown to become the most active tennis club in St Vincent and the Grenadines. Head man of the Grassroot Tennis Club Grant Connell, in reflecting on the past five years, said he is pleased with the strides the organization has made. âApart from providing the youths of St Vincent and the Grenadines with an outlet to unearth their latent tennis skills, we at the Grassroot Tennis Club have been able to breakdown that once erected social barrier which existed in the sport… I am pleased that we have played a role in this respect,â Connell noted. Retracing the pathway to the coming into being of the club, Connell said his vision began to materialize in 2009 when permission was granted by the DaSilva brothers â Bertille and Casper. âThe Da Silva brothers can be considered the godfathers of the sport and more so to the establishment of the Grassroot Tennis Club… They have both played a major role in breaking down the social barriers in tennis, by allowing people who could not play there prior to their purchasing it,â Connell reminded. âOver the past five years, we have not been idle, we have staged the first pre-school tournament, stringing courses, we have given back to students, we have supported the Breast Cancer Awareness campaign… We have not stuck on hosting junior tournaments â Easter, Christmas and Summer, as well the ITF tournamentâs Under-14 in 2013…. Tennis star Pat Cash has dropped in and we have produced a regional winner in Akeil De Roche,â Connell listed. Connell has high on the clubâs achievements the continuous enhancing of the surroundings of the club, including the placement of bins, engaging members of the local constabulary in training of the sport as part of its community policing and the refurbishing of dilapidated courts. âI am pleased with what the club has done… We will continue to make efforts to spruce up the facility and make that nexus from talent to stardom,â Connell projected. The facility as it now stands dates back to 1957 and has been credited with the development of a number of former national junior players, among them Grant Connell himself, Michael Nanton, the late Stuart Nanton, Peter Nanton, Karen Anderson, Trevor Sam, Stanley Sam and Matthew Ferrarri. Over the years, the property has gone through some ownership changes, with the Hadley family being the initial proprietor, while it remained as one of the premier tennis membership clubs in the land. Double faulted by some financial constraints, the Hadleys sold the property, with the burden resting upon a few of the members, who maintained the tradition of the club as an exclusive âmembers onlyâ facility. However, most of the players who frequented the courts had already moved on, whether in age or through migration; thus the facility fell into a state of disrepair and dilapidation.